Sou | 12:57 PM Feel free to comment! Update: I've added an animation and one of Don's charts to illustrate the depth of his deception. Denier Don (aka Emeritus Professor Don Easterbrook) is at it again on WUWT, confusing polar temperature swings with global temperature swings. He puts up gaudy drawings of ice core data and tells his big fat lies. He is telling the mob that global temperatures fluctuations are the same as those at the poles. Not so fast, Don. You might fool the 8% Dismissives with your tricks but it's too, too easy to show you up for the disinformation merchant that you are. Remember how your faculty outed your deceit and deception? See? Although in any particular location, especially in the Arctic where there is "polar amplification", the temperatures can rise and fall by large amounts, the surface temperature fluctuations, averaged over the earth as a whole, are much more moderate. 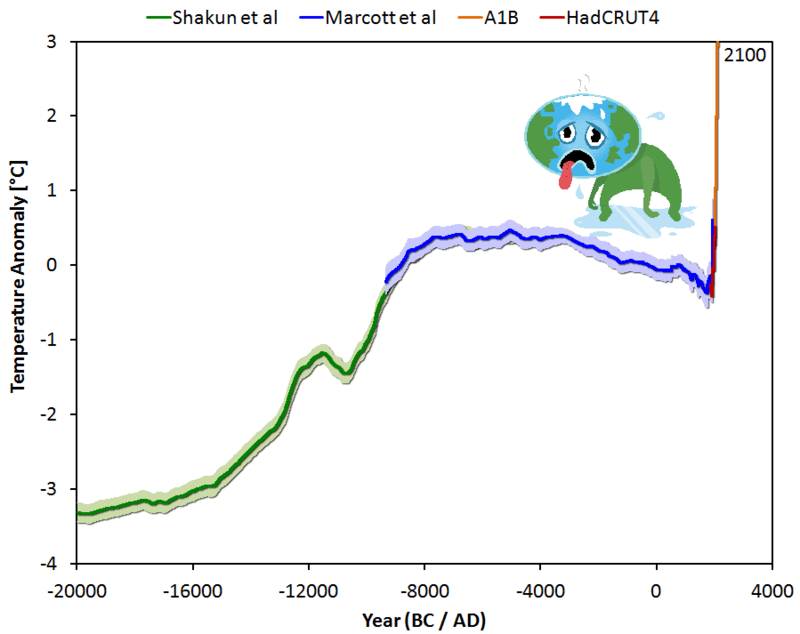 Even going back twenty thousand years, about ten thousand years before the Holocene, surface temperatures were only four degrees or so less than now. 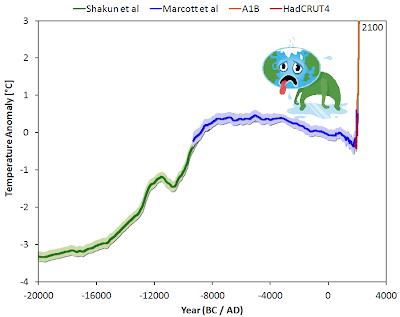 The two charts compare global surface temperature anomaly with the actual temperatures on top of Greenland ice sheet for a period from 10,000 years ago to 22,000 years ago. One thing you'll notice is that at the beginning of the Holocene (to the right of the charts), the temperature on the top of Central Greenland is around minus 30 degrees Celsius, much like today. Considerably colder than the average temperature of earth. Another thing you'll notice is that the temperature on the top of the ice sheet fluctuates a heck of a lot more than the average surface temperature of the entire world. On top of the ice sheet temperatures can rise and fall between minus thirty degrees and minus 50 degrees even over a couple of centuries. In the world as a whole, on the other hand, as you'd expect, it normally takes a few thousand years for the temperature to rise by a mere 3.58 degrees. Ten thousand years to be more precise. And to think that we are probably going to cause a temperature increase of a whole four degrees over less than two hundred years. What the hell are we doing to ourselves! Compare this to what Deceiver Don will try to have you believe. He plots global surface temperatures on the same chart as temperatures on Central Greenland, would you believe (see far right). Deceiver Don is actually expecting you to believe that global temperatures are the same as temperatures on the top of the ice sheet in Greenland! It's a favourite trick of his. Not only that, but Don minimises what he says is the 'warming by CO2'. Anthony Watts is complicit in the deception by posting this rubbish. What Don doesn't tell you is that past major warmings and coolings were also 'caused' by CO2 - in the past acting as a feedback to other forcings. It doesn't take much of a change in CO2 to result in a change in earth's surface temperature over time. Don is triumphant in proclaiming that humans didn't cause past glacials and interglacials. Well, whoopy doo! Even a fool like him could tell you that. What past climate change does tell us is the role of carbon dioxide in climate control - past and present. Check out this excellent video from Richard Alley and he'll explain it to you. Remember, Anthony Watts favours lies over truth and disinformation over facts - and is utterly inconsistent in his nuttery. PS Tamino is back, with a timely post on Honesty. June 2, 2013 at 11:10 am To anyone with an open mind, these data would be dispositive. The effect of CO2 is negligible, and at least so far during recent decades, beneficial. ...I guess John's mind was so open that his brains fell out. 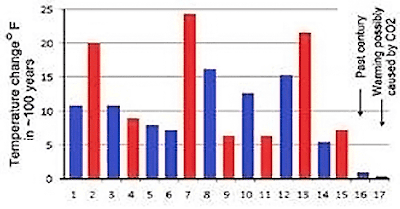 PPPS I notice that in the comments, Denier Don is still linking to one of his wrong charts, which Anthony Watts posted in his third of 28+ protests at Marcott et al. Even justthefactswuwt has rejected that chart as 'disputed'. Is Denier Don desperately dumb or just a dogged deceiver?